Mince pies, selection boxes and champagne are sure to become diet staples as the festive season gets underway, with normal health routines often taking a back seat. The season of sugar can be seriously detrimental to oral health and constant snacking and drinking puts our teeth at risk of cavities, which could result in starting the new year with a trip to the dentist. White Glo’s team of in-house dentists have put together a guide to the best Christmas food and drink hacks, to enjoy the seasons tempting treats, while still maintaining good oral health. The great debate on where to find the best mince pies fills news feeds throughout December, but to cut down on the sweet stuff, choose Waitrose all butter mince pies which contain 11.5g of sugar per pie, compared to over double in Sainsbury’s (24.8g) and Tesco’s (20.5g) treats. Chocolate and biscuit selection boxes are another essential part of getting in to the holiday spirit, but with the likes of Quality Street, Cadbury Hero’s and Chocolate Oranges containing over 58g of sugar, try opting for Ferrero Rocher or Lindt to almost half your sugar intake, down to 39g. Ditching the chocolate biscuits in favour of festive shortbread is another way to give teeth a break, with Walker’s shortbread containing just 11.3g of sugar, compared to the 38g in Fox’s famous Christmas selection. When it comes to the big day itself, hidden sugars in cranberry sauce and honey roast hams, not only rack up the calories, but also put teeth under attack for up to up to an hour after eating. If turkey without cranberry sauce is hard to imagine, choose Coleman’s version for just 4.1g of sugar per tablespoon, compared to well over double found in the ASDA (13g) and Sainsbury’s (10.9g) equivalent. 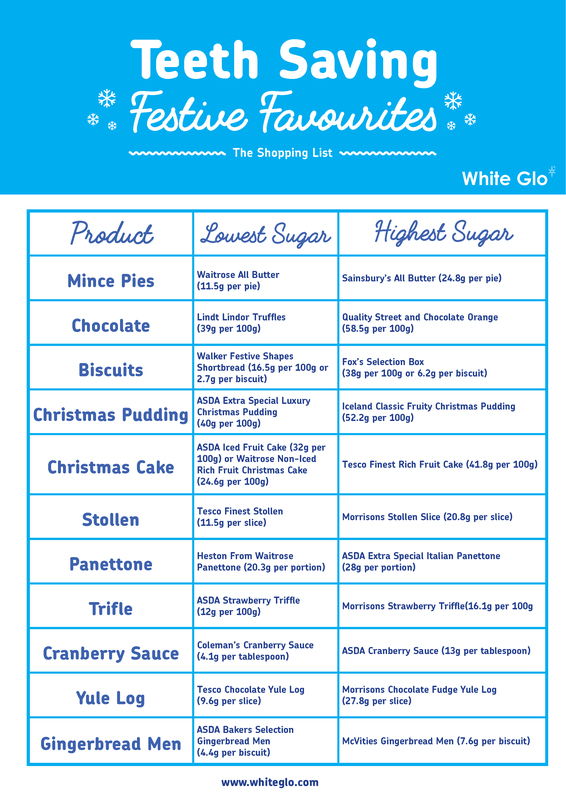 Further tips to minimise damage to teeth this Christmas includes choosing Asda for Christmas cake, for 32g of sugar, compared to the 41.8g found in Tesco’s version. To slash sugar even further, opt for a non-iced cake such as the Waitrose non-iced rich fruit Christmas cake, which has just 24g. ASDA is also the recommended place to pick up Christmas pudding, as it contains 40g of sugar, compared to the 52g or 49g from Morrisons and Iceland respectively. While Tesco doesn’t fair favourably for Christmas cake, it is the place to shop for traditional German stollen cake, as its Finest range contains just 11.5g of sugar, compared to the 20.8g found in Morrison’s range. Trifle, Panettone, and bucks fizz are just a few of the other indulgences to satisfy millions after the main meal. While opting for a smaller portion is advice many struggle to stick to, simply shopping at the right place could drastically reduce damage to teeth.